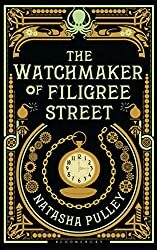 The Watchmaker of Filigree Street, Natasha Pulley’s first novel made a great impact on me from the start of the book. It is one of those books that I enjoyed very much, but don’t feel that I can really do it justice in a blog post. Even after a second reading I’m not at all sure I understand some of it. It’s long, complicated, packed with detail and an awful lot happens in it. When the watch saves Thaniel’s life in a blast that destroys Scotland Yard, he goes in search of its maker, Keita Mori ‘“ a kind, lonely immigrant who sweeps him into a new world of clockwork and music. Although Mori seems harmless at first, a chain of unexpected slips soon proves that he must be hiding something. Utterly beguiling, The Watchmaker of Filigree Street blends historical events with dazzling flights of fancy to plunge readers into a strange and magical past, where time, destiny, genius ‘“ and a clockwork octopus ‘“ collide. I was completely convinced by the setting in a different time in a world that was familiar and yet so different. I liked the writing style, although in parts it’s a bit ‘clunky’ and the use of ‘he’, ‘him’ and ‘they’ or ‘them’ made it a bit difficult to follow, but this is only a minor quibble. I also liked the characterisation and how the characters’ history was revealed and how their personalities were developed. Keita Mori is an interesting character and as I read my opinion of him kept changing – just who is he? He is an enigma, why is he living in London, is he the bomb maker, does he in fact know what is going to happen, is he a magician? He baffled and confused me as much as he baffled and confused the other characters. Equally fascinating are the sections set in Japan; Grace’s story, her research into luminiferous ether (a bit hard to follow), her relationship with Akira Matsumoto, the elegant son of a Japanese nobleman; the Japanese show village in Hyde Park where Gilbert and Sullivan went to research for the Mikado; the early days of the London Underground; and of course the clockwork inventions, in particular Katsu, the clockwork octopus. There is so much in this book, so many passages I underlined in my e-book, so many intertwining stories and lines that I have not mentioned – politics, the Fenians, bombs, the workings of the Home and Foreign Offices, suffragettes, racism, and class snobbery – I could go on and on. It may seem that this is a hotch-potch of a book, but the more I thought about it, the more I liked it. In fact I loved it both for its historical settings and for its ingenuity, producing a fantastical tale that occupied my mind during and after my reading. I reserved The Watchmaker of Filigree Street at the library but before it was available the e-book was on offer on Amazon, so I ended up reading from both editions. And in doing so, I can now see the benefits of both – I can underline in an e-book and make notes without any damage to the book and as it has X-Ray it’s easy to find passages about the characters and places etc. But the physical book is a joy to read – the text is set in Bell, originally cut for John Bell in 1788, and the cover is beautiful. This book also fits so well into the Once Upon a Time Challenge in the Fantasy Genre. I’ve seen it described as ‘steampunk’ but I’m not at all sure what that is – to me it’s historical fantasy. The copy I read was a large print from the library and didn’t have that wonderful map. I wonder if the author will write more in this universe… I think there’s plenty of mileage. I have half a review done but the grandkids are here so it’ll likely be the end of the week before I finish it. Cath, Natasha Pulley is indeed writing more books – her next one is called The Bedlam Stacks and is about the botanist for whom Mori originally made the clockwork pears, Merrick Tremayne. Mori’s in it briefly as a little boy; he takes himself on holiday to China and meets Merrick during an illegal tea-gathering expedition. See this Q&A on Foyles website. I definitely want to read this book, it has lots of elements that appeal to me. What an interesting-sounding book, Margaret! I do love books with a solid historical setting, and it sounds as though it’s got some terrific characters, too. It also sounds like an unusual but fascinating mix of fantasy and history. Glad you enjoyed it. I’ve been tempted by this book for ages, mostly because of the gorgeous cover. It doesn’t sound like my usual kind of thing, but you make it sound so interesting… hmm! FictionFan, it’s not my usual thing either and I wasn’t at all sure I would like it! But I was delighted to find it was and I did! I’m not a real fan of fantasy, but every now and then a book with fantastical elements will intrigue me and I find myself thoroughly enjoying it. The Watchmaker of Filigree Street sounds like such a one. Thanks for the introduction! And P.S. – the cover IS beautiful! !